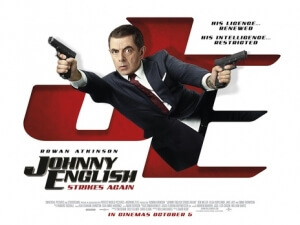 The very existence of a third Johnny English film is confounding to me; most people don’t even know there was a second film – I struggle to even remember it to this day – and while I remember watching the first one back in 2003 and enjoying it just fine, I don’t remember ever wanting to really see what this character would be up to fifteen years down the line. Was the British public really clamouring that hard for a sequel to a film most people have already forgotten about, especially when compared to Rowan Atkinson’s other, far superior work in the field of comedy? Well, whoever it was that demanded a return to the spy spoof franchise now has their wish firmly granted with Johnny English Strikes Again, an unnecessary sequel to an unnecessary sequel to an unnecessary feature spin-off of a Barclaycard advert, only this one somehow outdoes the previous one in unnecessariness by doubling down on the gravely unfunny writing that leaves one of Britain’s most celebrated entertainers left to make a shameful embarrassment of himself. The film’s plot rehashes certain elements from both previous movies (or at least, the parts I can remember), with Atkinson’s spy English being called out of retirement – a plot point lifted from the second one, only here he’s been abiding his time as a schoolteacher – after a cyber-attack reveals the identity of every secret agent working for MI7 – similar to how, in the first film, every agent was incapacitated leaving only English and his sidekick Bough (Ben Miller) left – and is brought back into action, only to bumble his way through each and every scenario he comes across – not just like in both previous Johnny English movies prior, but also what appears to be the majority of Atkinson’s filmography nowadays. There’s a whole bunch of set-pieces that call for plenty of silly slapstick on Atkinson’s part, including an extended virtual reality gag that’s all over the trailers for this film, as well as a run-in with a Russian spy (Olga Kurylenko), and an American tech billionaire played by Jake Lacy who it is not a spoiler to say he’s the villain in this because it’s so bleedin’ obvious that only someone as dumb as English could miss how this guy is clearly evil from the start. Aside from just rehashing plot elements from both previous movies, the film never succeeds in its one purpose; to make the audience laugh. Now, Rowan Atkinson is an extremely gifted comedic actor that I admire very much; whether it’s his physical humour with Mr. Bean, or his more sophisticated timing and wit as seen in the likes of Blackadder, or even some of his live performances which you can find scattered all over YouTube, Atkinson is someone who clearly knows how to work an audience and give them the right amount of laughs while also showing off his insane ability to perform in almost any capacity under the sun. Here, though, even he looks extremely confused as to why he’s here, because nothing in this script is working whatsoever, and he appears to have been given very little direction other than to smarm his way through scenes while occasionally mugging like he’s now playing Mr. Bean. It’s almost embarrassing to watch someone like Atkinson fumble his way through this dead-zone of a comedy, because while you can tell he’s still got a little bit of passion left for physical comedy, you can’t help but feel that his talents are being wasted on material that is so far beneath him that James Cameron is currently mounting an expedition down to its depths. The jokes here are extraordinarily stale and predictable, which also leads into another major problem with this movie; it’s boring as hell. You know what the punchline to some of these gags is going to be because you’ve seen them before in so many other comedies, many of them even ones that Atkinson had a hand in writing, and it adds nothing new to the table which quickly makes you lose interest in what’s going on because there’s nothing else to carry it for you. Johnny English is not a very good character because while he is certainly intended to be dumb, there is such a thing as being too dumb that it makes you want to scream at him, and celebrate when Emma Thompson as the Prime Minister – easily the best part of this movie, by the way – tells him off by screaming in his face about how stupid he’s been throughout this entire movie; everybody else, aside from Thompson, is given almost zero solid material to work with, except to just show up and in Olga Kurylenko’s case look pretty and nothing else. What’s more, the film keeps going on about how English rebukes modern technology to do things the old-fashioned way, which if this were a better-written script could have actually lent itself numerous comedic possibilities, perhaps by exploring and poking light fun at the vast differences between the old spying methods and the newer, more efficient things that a smartphone or tablet can do, but the film takes advantage of none of that in favour of doing more uninspired slapstick that not even a ten-year-old would giggle at. It’s rather sad to witness one of my comedic heroes stoop so low in his filmography nowadays that even his old schtick is no longer capable of generating a solitary laugh; I sincerely hope that Rowan Atkinson is given a chance in the near future to actually show the world what he can still do even this late in his career, instead of rehashing his greatest hits as a mere carnival act in the hopes of obtaining your hard-earned money. He deserves better, and frankly so do we. Johnny English Strikes Again is an unnecessary and wildly unfunny sequel that wastes a great comedic talent like Rowan Atkinson on material that rehashes several of his greatest hits with nothing new or interesting added to them, leaving him to make a saddening embarrassment of himself instead of showing that he is capable of so much more as an entertainer and a physical comedian.